Peel onion and finely dice. Cut peel off orange and cut orange in half. Roughly chop rosemary and parsley. Mince chili and half of garlic. Cut half of celery, tomatoes, and carrots and all of potatoes, fennel, and bell pepper into bite-sized pieces. Peel and devein shrimp. Fillet fish and cut into large pieces. Set aside one quarter of both the shrimp and fish for garnish. Cover mussels in cold water and set in fridge for approx. 20 min. Mince rest of garlic. Julienne shallots. Cut remainder of tomatoes, carrots, and celery into bite-sized pieces. Set aside. Heat up some vegetable oil in a large saucepan over medium heat. Add most of shrimp and fish, and some more vegetable oil. Season with salt. Add the half of potatoes, garlic, carrots, celery, tomatoes, and bay leaves and all of the fennel, tomato paste, saffron, all spice, some of the white wine, peeled tomatoes, rosemary, orange peel, lemon zest, and fish stock. Allow to cook for approx. 10 – 15 min. Place a food mill on top of a separate large saucepan. Ladle thicker pieces of soup into food mill and press to remove liquid. Heat up some vegetable oil in a large frying pan over medium heat. Add remainder of shrimp and fish from step 2 to pan and sauté for approx. 5 – 7 min. until opaque. Set aside. Drain water from mussels. In a separate large saucepan, heat up some vegetable oil over medium heat. Add shallots and remainder of tomatoes, garlic, carrots, and celery. Sauté for approx. 5 – 7 min. Then, add rest of bay leaves and parsley, mussels, lemon juice, and remainder of white wine. Season to taste with salt and pepper. Bring to a low boil and cover pan for approx. 10 – 12 min. or until mussels are fully open. 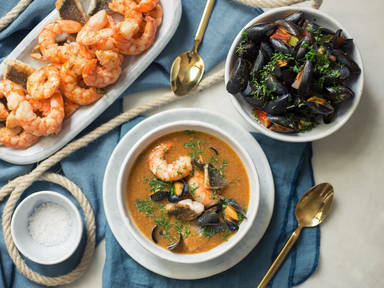 Ladle bouillabaisse into a bowl. Garnish with shrimp and/or fish, freshly chopped parsley, and mussels. Enjoy!